Discussion in 'The South' started by SK6, Mar 12, 2008. Carpooling is something we need to focus on as well. So, opening weekend at the 'Shoe? Is anyone else scared of the race fee increase or more importantly the gas increase this summer. I am worried I wont be making it to half the races I did last year. radar detector might not be such a bad idea. check out http://www.trapster.com - twitter for speedtraps! I've been looking at detectors for a long time now. The only problem is they are just so damned expensive! You can't get away with one of the cheapo $100 ones in Virginia, it has to be "invisible." 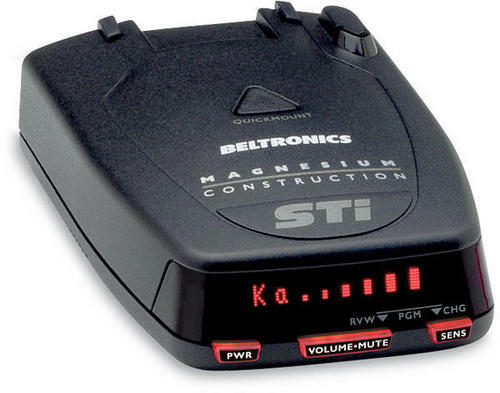 That is, not detectable by radar detector detectors. That Beltronics STi Driver I posted is one such unit. A radar detector or knowing where the speed traps are wouldn't have helped me on the way to the 'shoe last summer. I was cruising down 84 just west of Monterey, VA and came over a rise about 70 there was a state trooper traveling east who said that he knew I was going fast before he even clicked his radar on. Either take your lumps or slow down and enjoy the trip. I was able to request traffic school from the judge and get it dropped. The only problem with that detector Mike is that it doesn't tell you where the signal is coming from and how many targets there are. Cops love to hide in the shadows of automatic door openors at 7-11 and the like that use a very similar frequency. Check out Valentine One for a nice detector. You are right though they are expensive. The Valentine One is not invisible though, is it? Sure is. You are looking for anti VG-1 capability. None of them are truly invisible. What they do is make the outgoing signal so week that unless the officer is right next to you or there are no other cars on the road they can not tell who has the radar detector. Even with the officer right next to you he may not be able to tell who has the detector if there are other cars around. The low end detectors are so "hot" that they can follow the signal to you and can tell that you are coming as well. You must resist hitting the brakes when the detector goes off too. A friend of mine got busted when a cop was hiding back up on an entrance ramp and would look for brake lights when he turned on his radar. Radar detectors???????? How about a vehicle that gets 50+ miles to the gallon. Speeding some where should be the last of anyones worries. When fuel gets over 5 bucks a gallon this summer I don't think anyone is going to be worried about travel time. Yeah but we all like to go fast whether in the car or on a bike... that is just a given. You mean "Spectre" SK6. Not sure about that one since it is new. If it isn't invisible to it now then it will be. They have a non-obsolescence policy and you can always upgrade your detector.